Neurons typically send signals over long distances by generating and propagating action potentials over excitable axonal membrane. The action potential has three main stages: depolarization, repolarization, and hyperpolarization. Depolarization is caused when positively charged sodium ions rush into a neuron with the opening of voltage-gated sodium channels. Repolarization is caused by the closing of sodium ion channels and the opening of potassium ion channels. Hyperpolarization occurs due to an excess of open potassium channels and potassium efflux from the cell. action potential. : A brief reversal of membrane potential. caused by the slow closing of sodium channels and the opening of voltage-gated potassium channels. absolute refractory period: The period from the opening of the sodium channels until the sodium channels begin to reset. hyperpolarization: A phase where some potassium channels remain open and sodium channels reset. depolarization: Also called the rising phase, when positively charged sodium ions (Na+) suddenly rush through open voltage-gated sodium channels into a neuron. Action potential is a brief reversal of membrane potential where the membrane potential changes from -70mV to +30mV. When the membrane potential of the axon hillock of a neuron reaches threshold, a rapid change in membrane potential occurs in the form of an action potential. This moving change in membrane potential has three phases. First is depolarization, followed by repolarization and a short period of hyperpolarization. These three events happen over just a few milliseconds. 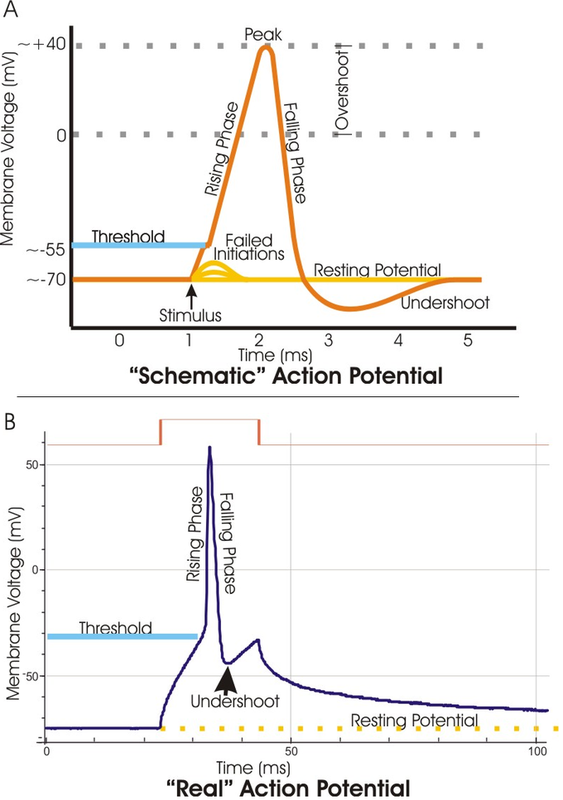 Action potential: A. Schematic and B. actual action potential recordings. The action potential is a clear example of how changes in membrane potential can act as a signal. The depolarization, also called the rising phase, is caused when positively charged sodium ions (Na+) suddenly rush through open voltage-gated sodium channels into a neuron. As additional sodium rushes in, the membrane potential actually reverses its polarity. During this change of polarity the membrane actually develops a positive value for a moment (+40 millivolts). The repolarization or falling phase is caused by the slow closing of sodium channels and the opening of voltage-gated potassium channels. As a result, the membrane permeability to sodium declines to resting levels. As the sodium ion entry declines, the slow voltage-gated potassium channels open and potassium ions rush out of the cell. This expulsion acts to restore the localized negative membrane potential of the cell. Hyperpolarization is a phase where some potassium channels remain open and sodium channels reset. A period of increased potassium permeability results in excessive potassium efflux before the potassium channels close. This results in hyperpolarization as seen in a slight dip following the spike. The propagation of action potential is independent of stimulus strength but dependent on refractory periods. The period from the opening of the sodium channels until the sodium channels begin to reset is called the absolute refractory period. During this period, the neuron cannot respond to another stimulus, no matter how strong.